Successfully Added Destino - Quadband GSM Dual SIM Wifi Touchscreen Cellphone to your Shopping Cart. Finally, a mobile phone that is at home anywhere in the world. Solidly constructed and dependable. Attractive and full-featured, it comes with everything you need for a better life! Including a free 2GB TF microSD card! If you're looking for a phone that has it all, then stop looking. The Destino has it all. First, the important stuff. 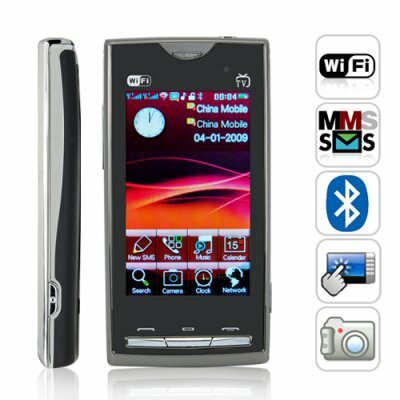 The M109 is a quadband GSM worldphone with dual SIM dual standby capability. Plainly speaking, this means it operates on the four global GSM frequencies (850, 900, 1800, 1900 MHz) and will work worldwide. Just as importantly you can insert two SIM cards into the phone and receive calls for either telephone number! But just in case you think The Destino is all brains and no beauty, have a good look at its hushed black and silver tones and elegant design. For those of you who like the Apple iPhone but think it's too fat looking, The Destino is what you would get if the Apple iPhone started going to a gym and doing cardio regularly. It sports a lovely 3 inch LCD touchscreen display and fits perfectly your hand owing to its candy bar form factor and solid feel. This is one phone you'll love owning! WIFI enabled so you can access the Internet for free whenever a wireless hotspot is available, The Destino comes with a first class music and video player, front and rear camera and camcorder, a personal digital assistant (PDA) and that's only the beginning. See the full specifications below to get a sense of how powerful The Destino really is. NOTE: This product is compatible with GSM at the four frequencies of 850MHz, 900MHz, 1800MHz, 1900MHz. It can be used throughout the world. Please check that your local cell network matches the phone's GSM standard. Supports RM Real Media files! Top choice! The backround sound application is the best.It is so real!!! Very good TV an Radio receiver. The best touch screen phone I reckon Chinavision have. Easy to navigate, touch screen very responsive. Usual chinavision featurs. top notch chinavision!! !